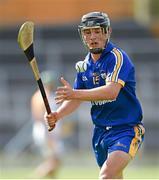 I only played half the season with Tipperary as I arrived to the hurling club so late in the summer. Since I started playing, we went unbeaten for the rest of the season. For the majority of the games there were only about 200 supporters but for the final vs Fr Toms that increased dramatically. There was nearly 1000 people supporting the two teams. Also for the final we had to march behind the Artane Boys Band and stand for the National Anthem of both Ireland and America. All of the games are only 13 aside unlike in Ireland which are 15 aside. This benefited the forwards greatly especially the inside line where there was a lot of space. That's where I played throughout my time in Boston and I had a successful campaign. Although there is a lot of space, there was one drawback. there was a lot more running to be done because of the oceans of space I had. This was not easy when you take all factors into account. the heat was unbearable with temperatures reaching well above 30 degrees Celsius and when you take the humidity into account, it was torture. My experience in Boston was wonderful and would encourage anyone who got the chance to travel to Boston and play hurling there, to take that opportunity.